We know how it is. No matter what your horse needs, there seem to be a hundred really good options and maybe a few not-so-good options. With all the choices out there, how’s a person ever supposed to pick the best product for their horse? Well never fear, friends. Mary’s Tack and Feed does the work for you so you can get on with what’s really important- spending time in the saddle! So without further ado, let’s chat topical hoof care, shall we? 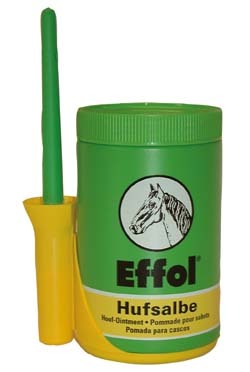 One of our favorite hoof products is a line from Germany called Effol, available both as an oil and as an ointment . Effol Hoof Oil is best for soft hooves, increasing the elasticity of the hoof wall to protect from (further) damage. It is also beneficial for dry and hard hooves, especially before shoeing. Effol Hoof Ointment, on the other hand, is best for brittle hooves that tend to chip. It is a different texture, more of a balm consistency, which helps protect the hoof from wet environments. It also has a disinfecting ingredient to help keep the hoof healthy. Many people in our Southern California area choose the ointment version over the oil during horse shows because it gives a more natural shiny appearance while repelling dust as compared to an oil hoof polish. Both the Effol Hoof Oil and Effol Hoof Ointment are superior products, providing benefits to horses in different conditions and with different needs. If you’ve got more questions or need some tips, we’re always happy to help. Just leave a comment here or give us a call at 1.800.551.6279 . Happy shopping!